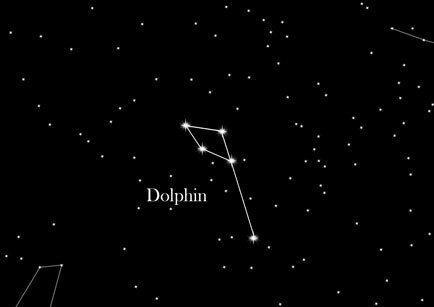 Delphinus (the Dolphin) is a small constellation with a distinctive diamond pattern, visible in the northern sky. It can be spotted to the east of the prominent star Altair, which is in the constellation Aquila. The friendly dolphin leaps past Altair through the heavens. This constellation is located in the Milky Way and is especially recognizable due to its distinctive, compact shape. A diamond of stars forms the dolphin’s body and a fifth star to the south completes the tail. Like the constellation Orion, Delphinus lies near the celestial equator and can be viewed from anywhere in the world, apart from Antarctica. The mythology of Delphinus tells of Arion of Lesbos, a famous Greek poet and musician who had collected a massive trove of treasure. On a sea voyage, his crew of sailors betrayed him for his wealth, granting him only one final wish: to sing his last song on the lyre. As he played his beautiful tune he was thrown into the sea, but was then rescued by a dolphin which carried him into the heavens on its back. Arion, his lyre and the dolphin now have a permanent place in the starry sky. An alternative legend tells of the sea god Poseidon and his newly married wife Amphitrite, who fled to the Atlas Mountains to protect her virginity. Poseidon sent out a dolphin as a scout to persuade Amphitrite to return. When he successfully brought her back, the god granted the dolphin a place in the heavens and the constellation was born.